Accommodation in Carlingford doesn't get any better than this. With a range of activities and things to do you will be sure to have an enjoyable relaxing stay with us. 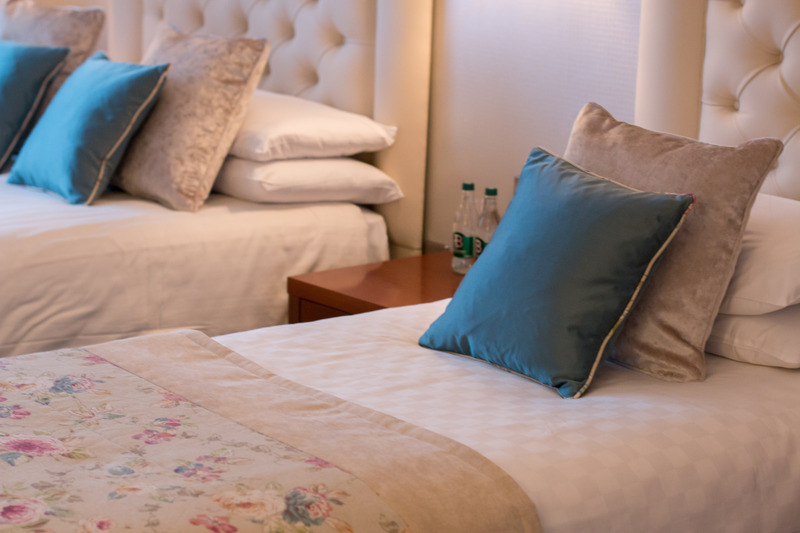 We offer 58 well-appointed, newly refurbished and luxurious bedrooms. Choose from our Standard Rooms, Deluxe Rooms, Family Rooms, Family Deluxe and Superior Rooms boasting a Four Poster bed and jacuzzi. Or why not treat yourself to the ultimate luxury and elegance with the best room and views in the house in our majestic Cooley Luxury Suite. The Four Seasons Hotel Carlingford specialise in providing premium quality modern Irish cuisine with an emphasis on fresh, seasonal and local produce. With one of the finest Restaurants in Carlingford the newly renovated Lough Lounge, lobby area for afternoon tea and a mesmerising outdoor deck with views of the private gardens, the Cooley Mountains and Carlingford Lough. Discover the true meaning of a spa break in the peace and tranquillity of our Luxe Spa. Our spa treatments and array of packages have been designed to encourage total comfort and well-being. Choose from Voya Hot Stone Facials, Full body massage and more to relax and unwind. Carlingford is equidistant from Dublin and Belfast only one hour from each city. The Four Seasons Hotel is located in the heart of Carlingford in the Cooley Peninsula. From Belfast take M1 to Newry then follow R173 along the lough shore to Omeath and then Carlingford. The Hotel is located on the far side of the village on the right hand side. From Dublin take M1 to Dundalk. Join the northern side of Dundalk at the roundabout for M1 & N52 (Ballymac). Take R173 then R175 & R176 to Carlingford. The hotel is located on the approach to the village on the left hand side. This magical village is full of character and is one of the best preserved medieval villages in Ireland. Raided in the 8th & 9th centuries by the Vikings and then in 12th century by the Normans, there ruins are still to be seen. The skyline of the village is dominated by King Johns castle, built in 1210. It towers over the harbour and along with the medieval town gate and the mint decorated with Celtic designs there is much to appreciate. The historical setting, the inherent natural beauty of the surrounding landscape and the myriad of activities make Carlingford the gem it is. by Una on 2 Nov 2017 Stayed a few times and have always enjoyed my stay. Lovely hotel in a beautiful location. Hope to return again. Absolutely top class. Everything was excellent. Beautiful room. Staff very pleasant and breakfast was gorgeous. Location perfect. Will definitely stay at the Four Seasons Carlingford again. Thanks a million for a lovely stay. Very nice hotel. Good friendly staff / service. Excellent location. Would stay here again. Lovely time spent at the hotel. FAB food, staff couldn't have been nicer. Spa was just the ticket. The only downfall was the noise in the corridor's at night time that kept us awake. Lovely hotel and perfect location! Had a beautiful room and I hadn't noted on our booking that we were celebrating our 2nd Wedding Anniversary - the Reception staff acknowledged this on check in and there was also a congratulations note with some chocolates in the room on arrival which was a lovely touch! Will definitely be back! by UH on 24th Aug 2017 Second stay at this hotel and have enjoyed my stay on both occasions. Main areas have been nicely renovated over the last few years. Bedroom needs a little updating but it was still fine. Very convenient for the center of Carlingford and for nice walks. Would return again. Great hotel in a great location at a fantastic rate! very enjoyable stay at this hotel, a little gem of a town! rooms very very clean, window on ground floor room would only open a little making the room extremely warm! Breakfast was super, would certainly return. Very enjoyable break in this lovely hotel. Best feature was the lovely garden where you could sip cocktails ( very reasonably priced ) on the terrace overlooking the garden while the sun went down. The bar food was of a very high standard ....far better than I would have expected from a hotel bar. Lovely smiling, friendly staff and we had a great room with a walk-in shower so I would certainly class this hotel as better than a three star category. Enjoyed mini stay at Four Seasons earlier this week. Hotel well appointed in Carlingford. Room was spacious and recently tastefully refurbished. Staff pleasant and helpful. Food adequate. Look forward to a return visit. Loved our stay in the Four Seasons Hotel Carlingford. The pool, sauna, steam room and gym all stay open late which was ideal for us. The location of the hotel is perfect as it is less than a 5 minute walk to the centre of Carlingford. All the staff, especially the ones serving breakfast and at the swimming pool, were super helpful and friendly! Cannot recommend this place enough if you want to stay in County Louth. Wonderful place to stay for a break in the lovely village of Carlingford. The staff were really helpful and friendly. really enjoyed ourselves hospitality and food first class. My husband and I had a most enjoyable 3 night stay in the four seasons Carlingford just a few days ago. We got a very warm welcome at reception on our arrival and our waiter in the dining room for dinner was the most welcome, helpful, cheerful, charming waiter we ever met despite the fact he was working with a splinted, broken thumb. Dinner was delicious and very nicely presented with a good choice on the menu. Staff at breakfast were cheerful and helpful each morning where there was an adequate selection of dood on offer. Our bed was very comfortable, room was clean and warm as was bathroom. Highly recommended and very good value. Just stayed there for one night was sorry I couldn't stay longer. The staff were wonderful and the food was so good I couldn't fit in dessert so I will have to go back. Great hotel, very friendly staff and delicious dinner included in our deal...would definately return...ideal location also.. This hotel is in a beautiful setting. The rooms were spotless. We had food while we were there. It was gorgeous. The staff are well mannered and catered to our every need. I would have no hesitation in recommending people to stay there. Stayed here on a 2night plus one dinner package break. After booking it I read some poor reviews on the hotel and was a bit apprehensive about the trip. I was pleasantly surprised to find everything was lovely. The room was clean and bright and the bathroom was spotless. Breakfasts and dinner were good. I had no fault to find with it. It is centrally located to the town and local walking trails. If looking for a quiet night away then this is the place but not for me, room was very clean no complaints there. The bar décor needs updating carpet grubby as was chairs. We were booked in for B&B&Dinner, the menu was limited 3 starters to choose from, I had soup it was that hot and thick(like concrete) that I had to add cold water from jug to enjoy it, my husband had pork belly he said he never tasted anything so bad, the veg were blasted in microwave. We complained to the waiter about quality of food but nothing came about it. Decided to have a drink in bar lacking atmosphere even if there was piped music playing throughout wouldn't be too bad. Breakfast was the norm improvement of evening before. Would I recommend Four Seasons no, needs to review there menu for package deals(different menu if paying for dinner separate not through package deal). Carlingford itself is lovely to walk about and Newry not too far to drive too. Excellent hotel in a wonderful spot. Food was good and staff were courteous. Facilities excellent Very good value!!! We stayed here for two nights and had a very enjoyable stay. The hotel was excellent, very clean and spacious, We had dinner and breakfast for two days and food was excellent every time. The staff were extremely friendly and welcoming. The leisure facilities were excellent also .The location of the hotel is fantastic being near shops and pubs and views were amazing. I could not fault the hotel and would highly recommend it to anyone looking for a short break in a great location. Hope to go back soon. Stayed at the Four Season this week en route to the Titanic in Belfast. Hotel as usual was excellent and the staff very friendly and helpful. Evening meal was excellent. By far our favorite hotel. Great leisure centre as well. Beautiful part of the world. Hotel staff were very nice the room was great the dinner was super as were the waiters. It would have been nice to have had the option of smoked salmon at breakfast. We look forward to our next break there soon . 5 STAR. Jim Thompson. We stayed here as a returning guest and we had a wonderful time, the hotel is lovely and in a great location, the dinner was fab and we were treated to wine on the house which was a lovely touch and we very much appreciated. we'll be back again as we visit Carlingford on a regular basis. Staff very professional and very friendly. We had a most enjoyable stay in the Four Seasons last week....staff were very friendly food lovely and accommodation very good. Would certainly stay again. A very pleasant stay. Service was very good. 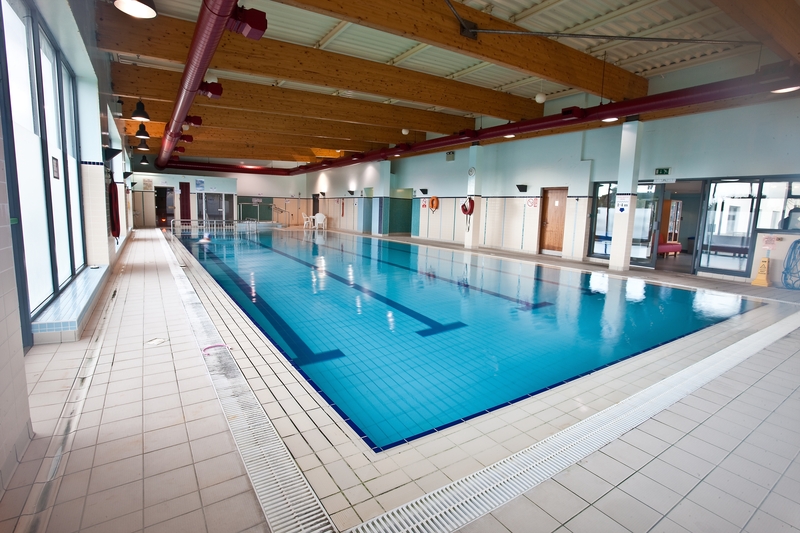 The Leisure Centre was clean and well maintained. Rooms are quite basic in this hotel and the residence lounge closed at 1am which I have never heard of before, however on a brighter note the staff were extremely friendly and all locals which was lovely to see. 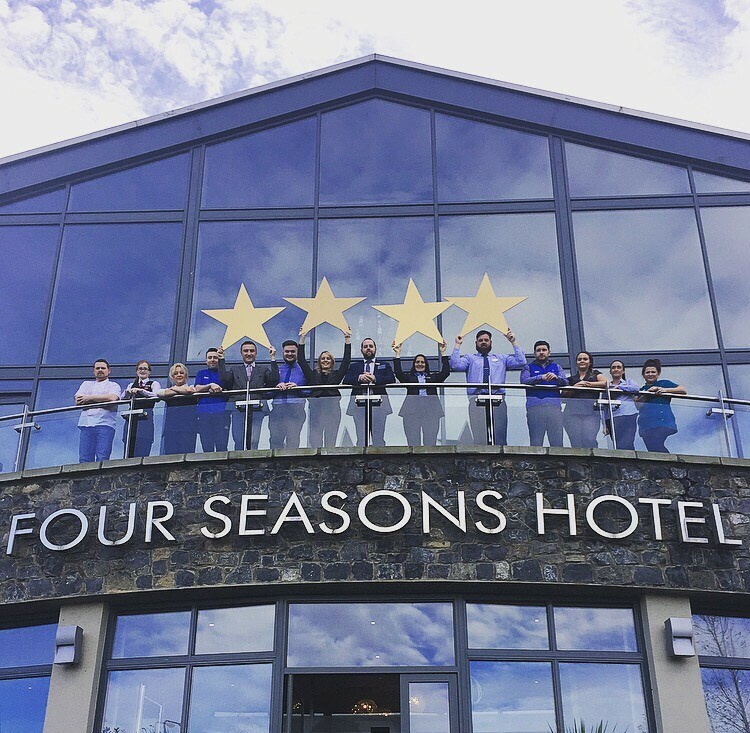 we enjoyed a great night at the four seasons hotel in carlingford. we were with a wedding party and all guests were made to feel so important. the staff were so friendly and the room and bed so comfortable. Stayed at the Four Seasons Carlingford for 2nights great value overall, room clean, warm and comfortable, use of swiming pool sauna and steamroom inclided.Breakfast was absolutley lovely and the girl in attendance was very pleasant and courteous. Good value meals are served lunchtime and evening. Overall execellent value., have stayed before and will again. I had a nice one night stay in Four Seasons on 15th Sept. Was a wet and windy day on arrival but once inside Catherine at reception Had all under control and I was able to go to room despite it only being about 1 o'clock. Room was grand for me but toilet and shower were for handicapped people which didnt bother me.. Hotel was still lively from wedding the night before. Thankfully the weather improved and I was able to explore the nooks and crannys of Carlingford. Slept well and had a lovely breakfast next morning thanks to friendly staff and layout of room. As is usual as a solo traveller I still had to pay for a double room. Haven't stayed in a hotel yet that will give you a single rate but I live in hope. All in all a nice hotel to visit. Thanks to all the staff. JOE. we really enjoyed our stay in four seasons carlingford. staff were very helpful and polite. rooms were good size double bed was dated and small compared to most hotels we have stayed in. bathroom was very clean and shower was a dream great power . i would go back but would love to see new beds. Brilliant location in a beautiful scenic village, lovely hotel, great leisure centre with a good size, even level swimming pool, staff very nice & friendly, had dinner there one evening, which was very tasty. Would highly recommend it. We booked a bargain break so we got a good value. Room and leisure center a bit shabby but ok. Reception staff were a bit erratic... Hotel setting and surroundings is beautiful and the food in Liberties Bistro was gorgeous. Great location on the outskirts of the town, however the signage needs to be improved, we nearly passed it the first time. The room was nice and the bed comfy, but the TV was Cr*p!!!!! It was discoloured and not all the channels worked. The wifi was ok but I would have preferred an ethernet connection in the room. If we hadn't had the laptop the TV would have led to us complaining. The shower and bathroom were grand but beware there is no plug for an electric razor, so bring an adaptor. the bar was nice and beside the restaurant, nice selection of drinks including the locally produced whiskey. The food was excellent and nicely served and presented. Breakfast was nice also and all staff are very friendly. The pool, jacuzzi and steam room were nice and clean and enjoyable to visit. The wet kit bags were a nice touch, other hotel pools need to provide same. The garden outside the bar/restaurant had a nice lawn and water feature plus smoking area. There was small bit of confusion when we booked in and checked out regarding the inclusive meals so ensure you have a print out or text showing your tariff. Also during our second night the fire alarm went off at four in the morning. This was a guests fault smoking in the corridor, but it took a very long time to turn off the alarm. The hotel were not at fault however for the initial alarm. Nice location and good facilities, I would recommend it. The hotel is in a great location,within walking distance of all the local bars ,restaurants and opposite the lough, the staff were friendly and helpful and the leisure centre was well equipped. We arrived midweek and were upgraded to a suite which was a nice touch. First trip to carlingford but would come back. Room comfy and large but curtains too let too much light in. Exercise class / loud music on the grass outside my window before 10am so if you're looking to sleep late... Fresh fruit available for breakfast - breakfast generally okay - coffee not fantastic. Didn't use the leisure facilities. Staff helpful. Dinner was good but my friend had the vegetarian option which wasn't. Bar staff very slow. Beautiful location overlooking the water. Overall a pleasant experience and good value for what I paid. Very dissapointed to enter our room to see the shape on the bed were some was obviously sitting after the bed had been made. Worse was to come. The toilet had been used and left unflushed. Disgusting. Bits of broken clear plastic on the floor which I thought was glass at first. After the shock of the room we had dinner which was nice but was spoilt by other guests shouting and roaring and staff didnt seem to ask them to keep it down. The bar was pleasent. Staff were polite and friendly. Breakfast was ok but the orange juice tasted like it was watered down. The hotel just needs to shake itself a little and all would be fine. Hotel had it all, with the leisure facilities and nice Bar & Restaurant. The room was basic but still had all we needed. Got at the right price this is a top place to stay. Carlingford is a friendly and buzzing little village and on a nice sunny day there are very few places that would beat it. Very helpful staff room was ok my husband cut his toe on the shower rim as it was very sharp so be very careful when getting out. The barman started to hoover the bar about an hour before closing had to waite for service every time we need a drink even though we were the only one in the bar. Maybe at the weekend there are more staff on duty? Lovely walks and drives in the area.